Between the late 1950s through the mid-1960s Jasper Johns experimented with shaped and compartmentalized canvases, notably with his 'American Flag Painting' – one canvas placed on top of another, larger canvas. Robert Rauschenberg's experimental assemblages and "combines" of the 1950s also explored variations of divided and shaped canvas. Argentine artist Lucio Fontana also began early on the experiment in shaped and compartmentalized canvases with his Concetto Spaziale, Attese series in 1959. Assigning a date to the origin of the postwar shaped canvas painting may not be possible, but certainly it had emerged by the late 1950s. Frank Stella, Kenneth Noland, Ellsworth Kelly, Barnett Newman, Charles Hinman Ronald Davis, Richard Tuttle, Leo Valledor, Neil Williams, John Levee, David Novros, Robert Mangold, Gary Stephan, Paul Mogenson, Clark Murray, and Al Loving are examples of artists associated with the use of the shaped canvas during the period beginning in the early 1960s. Geometric abstract artists, minimalists, and hard-edge painters may, for example, elect to use the edges of the image to define the shape of the painting rather than accepting the rectangular format. 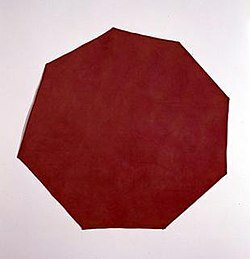 In fact, the use of the shaped canvas is primarily associated with paintings of the 1960s and 1970s that are coolly abstract, formalistic, geometrical, objective, rationalistic, clean-lined, brashly sharp-edged, or minimalist in character. There is a connection here with post-painterly abstraction, which reacts against the abstract expressionists' mysticism, hyper-subjectivity, and emphasis on making the act of painting itself dramatically visible – as well as their solemn acceptance of the flat rectangle as an almost ritual prerequisite for serious painting. While the shaped canvas first challenged the formalized rectangular shape of paintings, it soon questioned the constraints of two-dimensionality. According to Donald Judd in his Complete Writings: 'The main thing wrong with painting is that it is a rectangular plane placed flat against the wall. A rectangle is a shape itself: it is obviously the whole shape; it determines and limits the arrangement of whatever is on or in it". In 1964, the Solomun R. Guggenheim Museum organised the definitive exhibition 'The Shaped Canvas" curated by Lawrence Alloway. Lucy Lippard noted that this show focused exclusively on paintings with a "one -sided continuous surface" In 1965, Frank Stella and Frank Geldzahler confronted this definition of the shaped canvas by introducing three-dimensional shaped canvases by artists Charles Hinman and Will Insley in their seminal group show "Shape and Structure" at Tibor de Naguy in New York. The invasion of the third dimension by paintings was an important development of the shaped canvas as it questioned the frontier between painting and sculpture. The apertured, superimposed, multiple canvases of Jane Frank in the 1960s and 1970s are a special case: while generally flat and rectangular, they are rendered sculptural by the presence of large, irregularly shaped holes in the forward canvas or canvases, through which one or more additional painted canvases can be seen. A student of Hans Hofmann, and sharing his concern for pictorial depth as well as his reverence for nature, she also favors colors, textures, and shapes that are complex, nuanced, and organic or earthen – giving her work a brooding or introspective quality that further sets it apart from that of many other shaped-canvas painters. The Filipino artist Pacita Abad (1946–2004) stuffed and stitched her painted canvases for a three-dimensional effect, combining this technique (which she called trapunto, after a kind of quilting technique) with free-wheeling mixed media effects, riotous color, and abstract patterning suggestive of festive homemade textiles, or of party trappings such as streamers, balloons, or confetti. The total effect is joyously extrovert and warm – quite opposed to both the minimalist and pop art versions of "cool". Artists have often departed from the norm, especially in circumstances requiring special commissions, an example being the paintings Henri Matisse created for Albert C. Barnes and for Nelson Rockefeller. ^ "Edward Clark – The HistoryMakers". thehistorymakers.com. ^ Metro Times Book review of Edward Clark: For the Sake of the Search in the Detroit Metro Times, stating that Clark is "widely credited with making the first extended shape painting (continuing the painting out of its rectangular frame with paper and wood) in 1956. "It wasn't called a shape painting then, just something strange and different that began with that painting," Clark said. The untitled work was shown in 1957 at the Brata Gallery..."
^ Judd, Donald (1975). Complete Writings 1959–1975. Halifax: Press of the Nova Scotia College of Art and Design. pp. 181–182. ^ Meyer, James (2004). Minimalism: Art and Polemics in the Sixties. Yale University Press. ISBN 978-0-300-10590-2. Retrieved 26 November 2014.